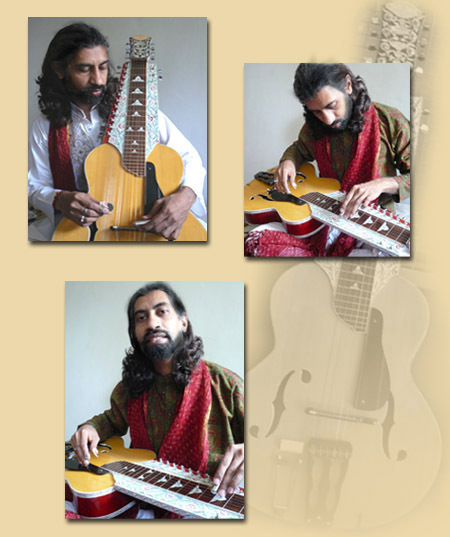 Amano Manish is a gifted slide guitar player trained in the Senia Maihar Gharana tradition, which was founded by Acharya Allauddin Khan sahib. In 1997, after moving to Puné, Manish resumed his musical training with Pt. Shekhar Borkar, a master innovative sarod player from the same Gharana tradition. Pt. Borkar inspired him to bring about many changes in the playing techniques of his instrument, and eventually helped him flower in his own style. His renditions are now enriched with tuneful intricate glides and melodic phrases blended with various staccato patterns. Manish calls his music a celebration of love and meditation, and aspires to share this quality on all his musical journeys.